Throughout 2015–2017 the LWF will hold events and offer ways of getting involved in commemorating the 500th Reformation anniversary. There are many possibilities and good entry points for Lutheran churches worldwide to “connect, contribute and participate” in the 2017 celebrations. Churches from around the world can also send their 2017 anniversary plans, resource materials, projects and calendars to the LWF. Look out for updates and see how you can participate. 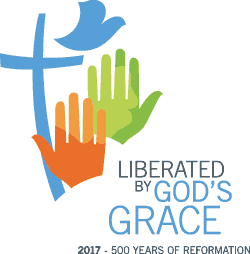 The Lutheran World Federation and the Catholic Church will hold a joint ecumenical commemoration of the Reformation on 31 October 2016 in Lund and Malmö, Sweden. It will begin with a liturgy in Lund Cathedral and continue with a public event in Malmö Arena that will be open to wider participation. Pope Francis, LWF President Bishop Dr Munib A. Younan and LWF General Secretary Rev. Dr Martin Junge will lead the common prayer service in Lund and the event in Malmö, in cooperation with leaders from Church of Sweden and the Catholic Diocese of Stockholm. "Even if I knew that the world were to collapse tomorrow, I would still plant my apple tree today" (ascribed to Martin Luther). As a means of expressing the 500 yeas of Reformation, the Luthergarten (Luther garden) has been established in Wittenberg on the grounds of the former town fortifications. Five hundred trees will be planted at different places in the city, giving a concrete sign of the optimism so clearly expressed in Luther's apple tree quote. Churches from all over the world and from all confessions are invited to sponsor one of the 500 trees, and at the same time plant a corresponding tree in a place that is significant for their own church. "Workshop Wittenberg" This global encounter will bring together 144 young reformers from all LWF member churches and several theology students sent by Lutheran faculties. The three LWF member churches in Namibia are hosting the next meeting of the Assembly, the LWF’s highest decision-making body.